Oriyarasoi - The cosmopolitan Odia's Kitchen ! 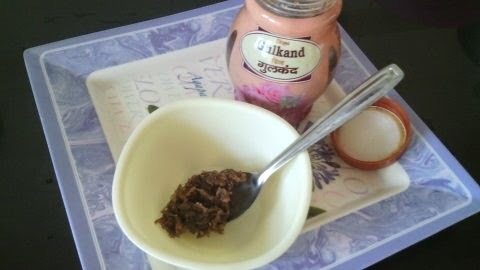 : Benefits of Consuming Gulkand (Rose Petal Preserve) !! Benefits of Consuming Gulkand (Rose Petal Preserve) !! It is early summer and Gulkand is back on my kitchen shelf. Yes, it is one of those summer essentials like prickly heat powder or Margo soap or even Aloe vera gel. But unlike the latter three which work on the outside, Gulkand is an Ayurvedic tonic which keeps the body cool on the inside. While it works best when consumed after a meal (given that it aids digestion), I find myself adding it various sherbats/lassis and even as a jam. Those suffering from acid reflux or constipation can have it just before going to bed at night. 1. It cures the ailments of the mouth and the digestive system in general. Controls acidity, mouth ulcers and body heat. 2. It is a powerful antioxidant and blood purifier. Consume two teaspoons a day for clear skin that is free from pimples, blemishes and boils . 3. Very helpful for ladies suffering from excess white discharge or even menstrual pain. 4. Consuming Gulkand can also reduce excess perspiration, body odour, itching and other such conditions caused by excess body heat. 5. It is an effective stress reducer as it calms down the nerves. 6. It improves appetite, digestion and metabolism. 7. It reduces uric acid levels in patients suffering from gout. 8. It gets rid of burning sensation in plans and soles. 9. It is given to pregnant ladies and kids who suffer from constipation as it is a mild laxative devoid of any side effects. However, it is not recommended for diabetic due to the high sugar content. There are many brands available but I use and recommend the 'Divya Gulkand' which is manufactured by Patanjali. It is very much pure and costs Rs 45 for a 400 gm pack . Wow I didn't know that there are these many benefits of Gulkand.